Glassybaby is a hand-blown candle votive created in Seattle. 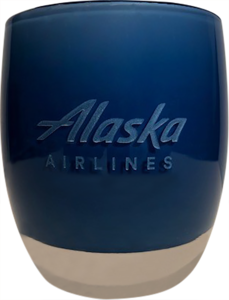 This glassybaby is deep etched with "Alaska Airlines". They fit into the palm of an average hand and stands almost 3.75” tall. Each glassybaby is distinctly unique to where you will never find two alike. For each glassybaby purchased, glassybaby will donate some of the proceeds to one of their organizations from the “White Light Fund”.